With data connection rates still comparatively pricey in Nigeria, Wi-Fi hotspots are often a source of joy for most smartphone/device users in need of some free Web browsing or social media time. The benefits of free Wi-Fi access such as the ease of connectivity and opportunity to conserve cellular data makes it a common occurrence for most users to seek out these free connections in public locations such as parks, banks, hotels, restaurants, etc. Findings by the Research and Development Unit of Yudala – Nigeria’s fastest growing composite e-commerce outfit – show that caution must, however, be exercised when accessing sensitive personal information and/or carrying out online shopping or mobile banking activities over a free public Wi-Fi connection as this could pre-dispose you to grave losses from hackers. Armed with routers, remote spying software and other tools of their nefarious trade, these hackers – whose increasing level of sophistication is a source of global alarm – are capable of setting up fake hotspots which booby-trap you into thinking you are connecting to the Wi-Fi of a hotel you are staying in, for instance, while in actuality, you have fallen prey. 1.Always remember you’re vulnerable on public Wi-Fi: This knowledge is essential as it will help keep you wary when using public Wi-Fi networks. Due to their often unsecured connections, chances are that the Wi-Fi hotspot you have so gleefully connected to is also occupied by a potential hacker. Within this shared virtual space, it becomes considerably more easy to infiltrate your device and compromise your personal information. 2.Disable automatic connection to Wi-Fi networks: Most smartphones are capable of automatically connecting to available Wi-Fi networks – a development that may expose you to lurking hackers. While this feature is often disabled by default, you can do yourself a world of good by double-checking to make sure. Better still, you can tweak your device’s settings to ensure manual connection to Wi-Fi hotspots. This way, you are protected from unwittingly connecting to a rogue network which may compromise your privacy and other sensitive information. 3.Verify the network’s name before connecting: Research shows that most hackers label their fake hotspots with generic names that may fool you into thinking you are on the right network. A public institution such as the Nigerian Communications Commission (NCC), for instance, may not have its public Wi-Fi network named “Free NCC Wi-Fi.” Same goes for that hotel you may be staying in or the fast food outlet on the street corner. Obvious generic names such as these could be a well-sprung trap by a hacker to snare unsuspecting users. 4.Stick to HTTPS for websites: To avoid exposing yourself to the risks of being hacked over a public Wi-Fi network, stick to websites that use HTTPS during your internet surfing activity. While regular websites transfer content in plain text thereby making it an easy target for potential hackers; websites that use HTTPS, on the other hand, encrypt your activity thus offering an extra layer of security. In order to be sure you are on an HTTPS website, simply look for a padlock in the address bar or check the URL for "https://..."
In addition, you can download and use a software such as HTTPS Everywhere to protect your data. HTTPS Everywhere is a Firefox, Chrome, and Opera extension that encrypts your communications with many major websites, making your browsing more secure. 5.Turn off file sharing when using a PC: While you may not have a direct control over the Wi-Fi network you are connected to, your computer is thankfully still in your control. Your computer may share certain information such as your printers, files, music library or even go as far as granting remote login to other computers on a trusted network or your personal Wi-Fi network. If not disabled when connecting to a public Wi-Fi network, you may just be opening the door to a potential hacker. 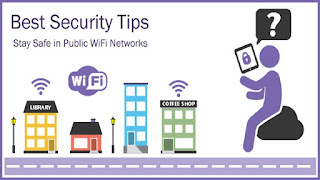 6.Keep all financial transactions off public Wi-Fi: This applies to mobile banking, online shopping or any other activity that involves exposing sensitive personal or financial information. Every public Wi-Fi network should be regarded as a major security risk as you may be sharing these connections with an eagle-eyed hacker. Where the transactions cannot wait until you get to a secure network, it is best you rely on your cellular data for these purposes. If you wanna track someone else's activity on a phone or tablet, here is the best way to do this.